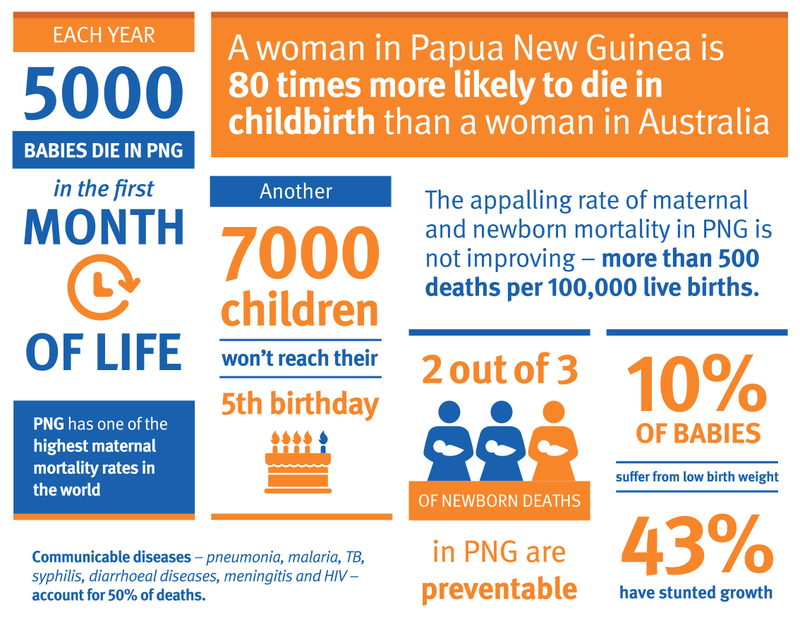 The rate of maternal and child death in Papua New Guinea (PNG) is staggeringly high, with one of the highest maternal mortality rates in the world – more than 500 deaths per 100,000 live births. This is about 80 times that in Australia and equates to up to 1500 mothers dying each year. Neonatal mortality has been alarmingly slow to improve. 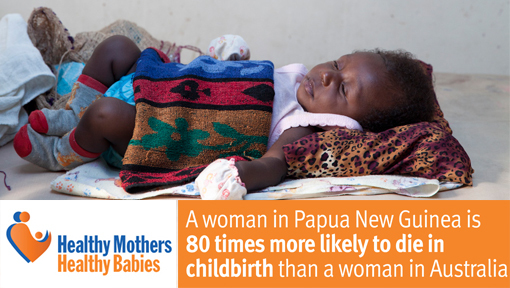 In PNG, 5000 newborns die each year. Up to two thirds of these newborns could be saved with basic but effective interventions. Health care in PNG is challenged by its unique mix of diverse populations, rugged geography and constraints in infrastructure. In most areas life-saving health services are under-utilised or accessed late. Contributing factors include physical access difficulties, financial barriers for families, lack of understanding of the need for supervised childbirth, as well as other cultural factors. Operational and implementation research is urgently needed to identify, trial and prove better ways to deliver appropriate health care within rural and disadvantaged settings of PNG. This is what drives our proposal for an integrated, longitudinal study of diseases, outcomes and health service utilisation at this critical point in the life cycle. An underused, but powerful, mechanism for improving health and development is collaborative research. Seeing collaborative research as a means of development involves firstly, doing it jointly with local partners who have a long-term stake in a community, and secondly, focusing on issues that are recognised as critical. What one discovers for oneself is much more likely to be used than good ideas introduced by even the best teaching methods. The overall HMHB program aims to define the major causes of poor maternal, newborn, and child health, and to identify feasible, acceptable and effective interventions and service delivery strategies to improve reproductive, maternal, neonatal and child health (RMNCH) outcomes in PNG. Identify and quantify major causes of morbidity in mothers, newborns and infants attending health care facilities, and the relationship of morbidity in pregnancy to predicting poor pregnancy outcomes for mother and infant. Evaluate maternal and child heath services and identify strategies to improve services aimed at reducing sickness and death. Examine sexual and reproductive health knowledge, attitudes, practices and outcomes among young people. Identify strategies to improve RMNCH care and strengthen disease control targeted to populations in PNG with varying levels of access to health services. These five program objectives will be addressed by five separate but linked studies. The emphasis is on the generation of evidence that has immediate use in East New Britain (ENB) in improving services, and that can inform future health policy in PNG and similar settings. This requires a research program with an operational and implementation focus. Throughout the HMHB program there will be a strong focus on capacity development. This will occur on multiple levels, including training for local research staff, mentoring of local researchers, as well as facilitating and providing technical input for research and quality improvement activities at the health facility and at the provincial level.